Are you searching for the best inexpensive multimeter? Like many other people, I believe your answer is yes. Maybe you are a first timer and would like to buy the best device right from the word go, or you are a seasoned user looking to replace an aging or faulty meter. Well, with so many options available on the market, it may be a little overwhelming deciding which one you should go for. Should you stick with a trusty analog meter or go for modern digital multimeter (DMM)? Is it possible to get a quality device without burning holes in your pocket? What are some key features of a good multimeter? These are just a few of the questions you may be pondering. Before we go any further – lets get something out of the way. If you stumbled across this page, you are probably looking for a good, yet cheap or inexpensive multimeter. Although the team here at MultimeterExpert loves Fluke meters and recommends them frequently, they are far from inexpensive. Thus, we will not be covering a Fluke meter here. You generally pay a bit extra for the Fluke name, which inflates the price a bit. A multimeter is simply a tool that helps in checking and measuring electrical parameters and values. These include voltage (V), Current (Amp), and Resistance (Ohms). It features two probes, one red and the other black, and the two ends are normally connected to the object being tested. The original form (analog multimeters) featured a micrometer with a needle that moves inside a dial, indicating the readings. Digital Multimeters display the readings in numerical form and are generally easier to use. What’s a Multimeter used for? 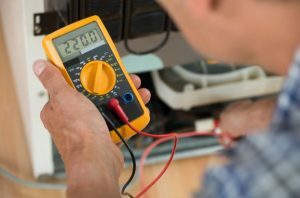 A DMM is useful in checking for electrical faults, short circuits, open circuits, resistance, voltage/ current leaks, and much more. It is also useful for testing various parts such as fuses, resistors, diodes, wires, bulbs, sockets, plugs, circuit boards, transistors, etc. Multimeters come in different sizes, designs, brand names, functionality, and more. What may work for you may not be the best for another person. For instance, an inexperienced person may find using an analog type a little challenging in comparison to a seasoned professional. And like other people, you want the best meter that is accurate, easy to use, durable, practical, features a clear display and is reliable. Here are the highlights of the 3320 – If you are looking for more details on this meter, check out our full review of the Innova 3320. We also love the decently sized digital display that relays clear numerical values. To add on to this, the multimeter is Auto-Ranging meaning that it automatically detects the parameters and you don’t need to keep changing the set values. One of the key things that drew us to the INNOVA 3320 is its rugged look and feel. The unit feels very solid to handle regular use, accidental bangs, and abrasion, shock, impact, vibration and more. This aspect is further improved by the rubber corner guards that take the impact or shock instead of the sensitive internals. The item features a versatile and universal design and should work okay in most settings. These include automotive use, HVAC, home electrics, electronics repairs, electrical circuits, computer repairs and for a hobbyist. For easy use in different electronics, DC or AC, the gadget includes Single-setting resistance. In comparison to some of its rivals, the INNOVA 3320 has a larger and clearer display. These should make reading the values not only easier but also quicker. The manufacturer went a step further to incorporate color-coded LEDs for easy checking of a battery’s status. Green means good, yellow means it’s a little weak, while red is telling you that the battery needs replacement. Just like the size, the weight of the multimeter is within range. You won’t get too tired of carrying or using it. For an easier experience, you also get built-in wrist wraps and stands for Hands-Free testing. The Reverse Polarity feature is yet another strong selling point for the device. And true to the claims of many analysts, the company, and consumers, this digital multimeter works well. It won’t get damaged due to connecting the probes in reverse order. And for extra protection from electrical shocks, the multimeter has a robust and rugged design. We agree with many other people that it’s among the most affordable meters on the market. Despite its range of features, sturdy construction, and decent quality, this gadget will generally set you back less than $25 (prices vary, so we don’t display them here – please check with Amazon). And if you are among the people who worry about your safety while using a multimeter, then you be more at ease with the INNOVA 3320. This is because it is UL certified in regards to safety and quality. -Auto Ranging: A good multimeter should be able to automatically recognize the testing parameters. In contrast to manual ranging, you won’t need to set values all the time. -Accuracy: Top meters are accurate and this helps to give proper readings. This is essential to prevent an incorrect diagnosis or failure in finding a fault. -User-friendly: We also focus on how easy it is to use the multimeter. The display should have a decent size, the digits or numbers should be clear and the knob well-placed for easy reach. Reading a digital multimeter is way easier than the analog type (for beginners at least). -Safety Features: A good item will protect the user from voltage and current. This is done but using a shockproof casing, using circuitry that can handle high current, the probes will feature shrouded banana plugs and the unit may also come with internal blast shields. -Price: We also paid attention to the cost of the item. Our intention was to find a high quality, reliable, durable and effective piece that costs less than $25. 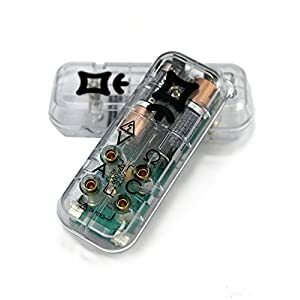 -Prevents electrical shock: The device will allow you to work on electrical circuits while minimizing the risk of an electrical shock or electrocution. It supports both DC and AC voltages. -Correct diagnosis: Owing to its many values/parameters (amperes, voltage, ohms, continuity, polarity…), you will be able to unearth a problem much faster while using minimal effort. -Saves time: Using a multimeter is not only easier than other methods but also fast and safer. Simply set the value, attach the prongs, and get the outcome on the display. -Cost effective: This accessory saves you the trouble and time of using guesswork or Trial & Error. The top types are easy to use, fast and also very accurate. The Innova 3320 scores highly for its range of features which make using it easy even if it’s your first time. It also gets the nod for being among the easiest to operate thanks to the large digital display, good size and weight, hands-free capability, and good accuracy. 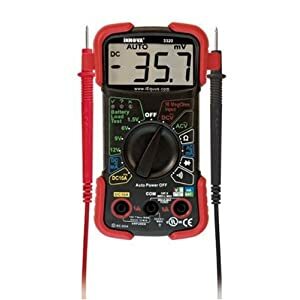 All-in-all, in our honest opinion, anyone looking for the best inexpensive multimeter will find the Innova 3320 Autoranging Digital Multimeter worth buying. Are you looking for the best automotive multimeter that can help you perform your auto troubleshooting tasks with ease? Multimeters are great tools for any serious technician or electrician who wants to work more effectively and efficiently. Without this tool, you can do practically nothing when working on electrical parts at home or in your car. There are different types of multimeters ranging from home multimeters to automotive ones. This review is going to focus on the best types of auto multimeters available in the market today. If you intend to use the most ideal testing tool for your job, it is better to consider only the ones with the best features that are very durable. The 4 multimeters reviewed here are highly regarded in the industry as customer reviews and ratings have shown. So, which is the top automotive multimeter in the market today? 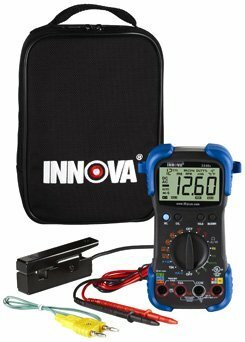 The Innova 3340 is a high grade multimeter. It is designed to help you accurately identify engine problems as it tests switches, wiring, breaker points, solenoids, duty circle, alternator diodes and many more. This multimeter features over-load protection, auto shut-off and auto-ranging. The meter is widely regarded in the market not just because of its features but also because it is sold at a reasonable price. The Innova 3340 is designed with a temperature probe which effectively measures temperature in both Fahrenheit and Celsius. Unlike some other models in the market, this multimeter is extremely simple to use. With rugged corner guards and hold buttons, you are guaranteed ultimate protection as well as highly accurate testing for all types of auto electronic jobs. It comes with a clamp style lead, probe, test leads, nylon storage pouch and a user manual. If you are not fully familiar with multimeters, it is better to go through the instructional manual carefully to acquaint yourself well with its uses. Most of the bad reviews are not necessarily because of any defects in the product but due to incorrect usage by the customer. So, you are advised to carefully read the instructions before working with this tool. Here is another high quality multimeter from the Innova brand. It is designed to accurately and safely troubleshoot different household and automotive electrical problems. This meter is versatile with auto-ranging scales which eliminate the need to manually dial the range when making electronic measurements. Other great features of the Innova 3320 multimeter include rubber corner guards, attachable test leads, single setting resistance function, large digital display, auto-ranging scales, color-coded LEDs and 10 MegOhm input. Interestingly, it is also one of the cheapest models on the market. The Innova 3320 is highly regarded as customer reviews and ratings have shown. 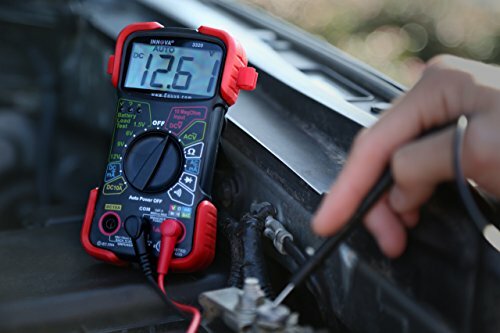 This is the ideal multimeter to have if you want an accurate and effective measuring tool for your household and automotive jobs. For those looking for a very affordable tool that can guarantee accuracy, this is the best option for you. This tool oozes quality in all areas. The Fluke brand always produces high quality multimeters and this Fluke 77-IV model is no exception. The tool is rugged, easy to use, reliable and accurate. The fact that it is made in America is an added advantage because it passes all safety standards. Fluke 77-IV is a general purpose multimeter that provides the most basic features needed to fix any electrical faults in your car. Although it bears the name “automotive”, this meter can also be used for home appliances and other types of applications. It is ideal for professionals who always need to get accurate data and measurements. The Fluke 77-IV can equally be used by amateurs and DIY persons who may not have strong knowledge of electrical applications. The tool is very easy to use unlike some other types of multimeters that are designed in too technical a fashion. It has both manual and auto ranging which offers you great versatility when making use of the tool. It can be used for auto repair, bench repair as well as for field service. The Fluke 77-IV has a large display which makes it easier to read on the screen. It also responds faster than other types of models in the same category as this one. Overall, the Fluke 77-IV has all the features you will ever need to help you achieve better performance at work. 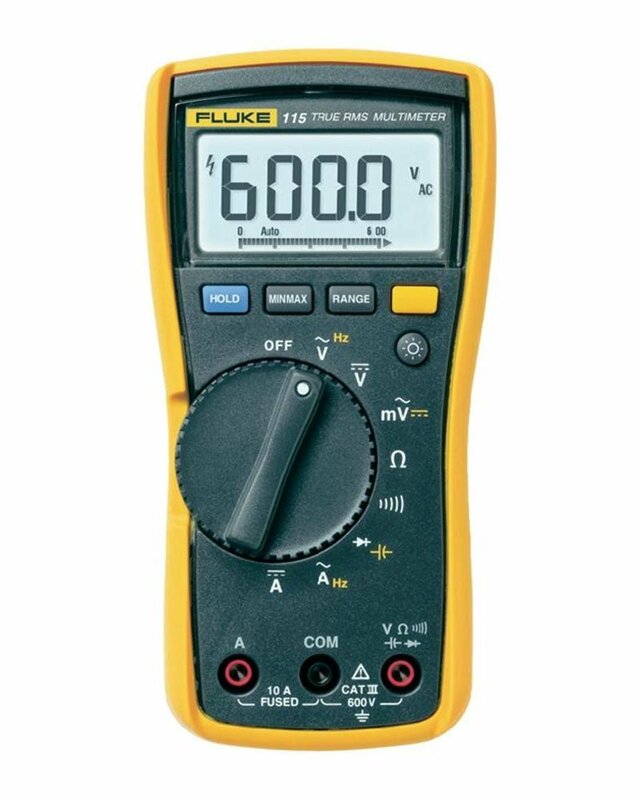 The Fluke 88v is another excellent multimeter model from the Fluke brand. It is specifically designed to assist auto professionals solve auto problems faster. This model comes with lots of features that can help you perform any electrical task more effectively. It has troubleshooting and measurement functions which can solve almost any problem with hybrid and conventional vehicles. Interestingly, it is not only meant for automotives. 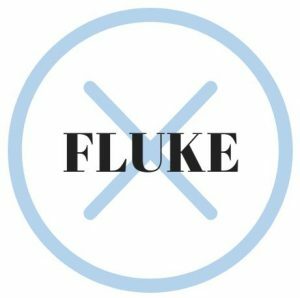 The Fluke 88v can be used for household electronics too, so even if you bought it for automobiles, this does not prevent you from using it for other gadgets if the need arises. This adds versatility to the many features it possesses already. The Fluke 88v has all the features you will find in other Fluke models. The company is widely regarded by many as the best brand on multimeters in the industry. This model is properly designed to meet that standard. Its automotive test functions include current, resistance, AC voltage and DC voltage. There is also the max/min recording for logging the lowest and highest readings over time. Fluke 88v has all it takes to give you the best testing and troubleshooting performance in your auto operations. Automotive engineering and electronics is a vital job that needs the best quality tools for effective troubleshooting. Those who have experience in this industry will understand that a multimeter is a tool you simply cannot do without. It is very important to select the ideal multimeter when working on automotives and other household electronic gadgets. If you are looking to select the best automotive multimeter, the above models are definitely worth investigation. 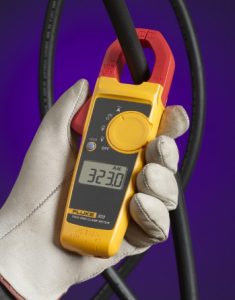 If you have been searching for a portable and reliable troubleshooting tool that can help you out with your readings, the Fluke 323 True-RMS Clamp Meter is certainly an excellent choice. Both commercial and residential electricians will love it since it comes at a truly practical size and it does not lack anything in terms of quality and efficiency. Whenever you need it, you take it out and start working towards identifying the electrical problem that has been messing with the specific project. 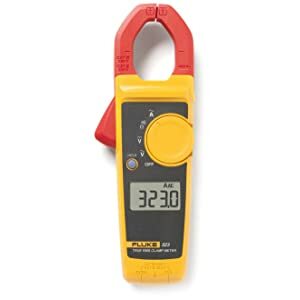 Let’s have a closer look at the pros and cons of this product in a detailed Fluke 323 True-RMS Clamp Meter review. 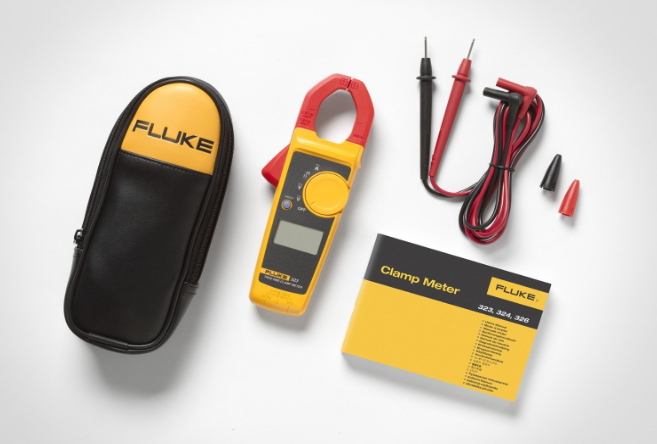 As this Fluke 323 True-RMS Clamp Meter review has shown, this is a reliable product for electricians that want something easy to use, modern and without taking up too much space. It comes with two-year warranty, hold button, and soft carrying case. However, there are some problems that you may need to put up with. If you are fine with the confined space for the test leads and you can settle for 400 up to 4 kΩ voltage readings, this is a fine piece of machinery that will certainly make your job easier. Here is our Mooshimeter Wireless Multimeter review. During our time with this meter, we learned that it is truly unique! It features all of the features of a normal multimeter, minus the screen. 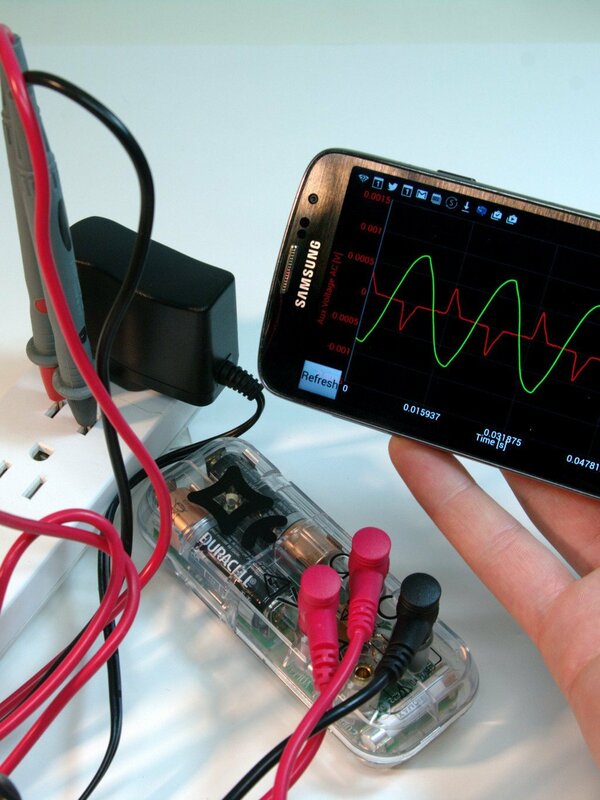 The Mooshimeter Wireless Multimeter uses your smartphone or tablet (IOS or Android device) as the display. This not only allows for easier saving and sharing of your multimeter readings, but also makes for a very light and compact multimeter. 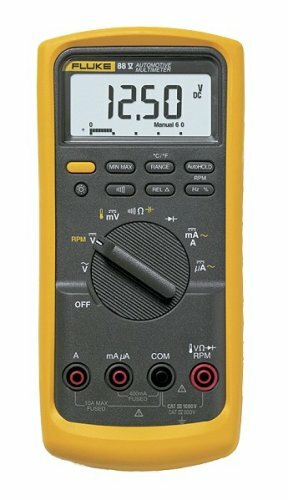 This multimeter features a smaller than average form factor, yet sports the most commonly seen features among most multimeters, as well as a few more unique features that are less commonly seen. Notable features include: dual channel measurement, voltage to 600V, current to 10A, and resistance range of 20ohms to 20Mohms. It also features a Bluetooth 4.0 connection to your smartphone or tablet. The IOS and Android apps are both available free of charge on their respective app stores. This is an IEC CAT III meter. This is one of our favorite meters we’ve reviewed recently. Mostly due to the unique app integration and on-screen readings. This no doubt a handy device that also appears to be quality-made. 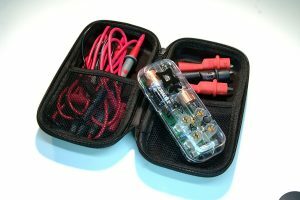 It would be a nice addition to any electrician, engineer, or even hobbyist toolkit. If you are looking for a basic, no-frills, or budget meter however, we would look elsewhere. INNOVA 3320 Auto-Ranging Digital Multimeter has been designed conveniently and accurately to diagnose different electronic problems both in automotives and in homes appliances. It is one of the most accurate autoranging multimeters you will see on the market. With its special features, you will be able to easily detect faults and find the perfect solution to any electrical problem in little time. It saves you a whole lot of effort and removes any guesswork when troubleshooting appliances. This article is will provide a comprehensive review of the INNOVA 3320 multimeter. The most basic function of this multimeter is the measurement of DC and AC voltage. 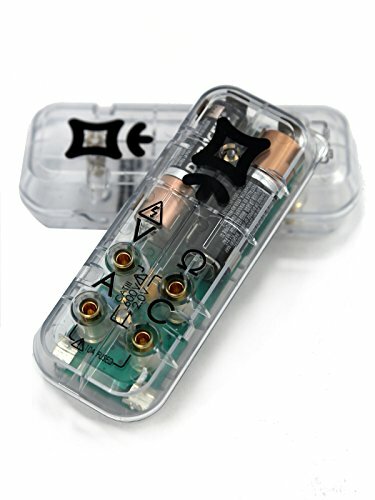 Other functions and features include audible continuity checker, diode checker function, measuring resistance and the measurement of AC/DC current. 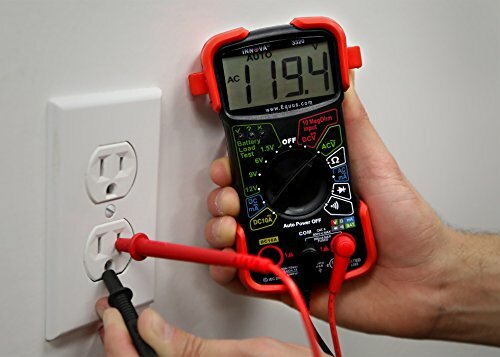 However, one unique feature of the INNOVA multimeter is the fact that it measures up to 200 MA of AC current and 10 amps of DC current. 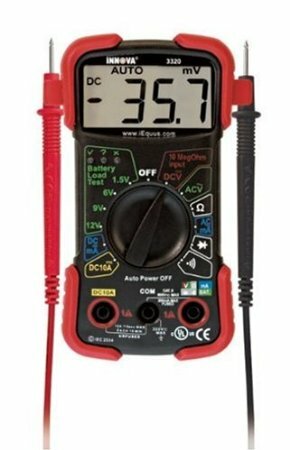 Most people need a multimeter for the measurement of DC current and it is rarely used to measure AC current. This makes the INNOVA 3320 model a worthwhile investment since it has enough DC measuring capacity for most applications. Because the circuit board of the multimeter makes use of prime spec electrical components, the meter reads very accurately when used for measuring current and resistance. According to most customers who have used the meter, it is the most consistent multimeter ever manufactured. Moreover, it is quite affordable compared to other auto ranging multimeters in its category. Most auto-ranging multimeters of the same price range with this INNOVA model have very slow auto ranging speed. But with INNOVA, you will get accurate and fast measurements which leads to increased efficiency and saves time into the bargain. It comes with a battery load tester. 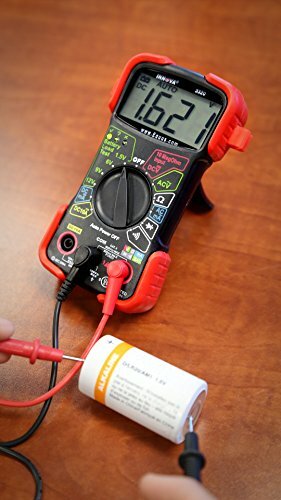 This is an added advantage if you deal with batteries and sometimes need to test the battery to know its status on the tester that indicates color red for bad, orange for weak and green for good. This provides the best method of ascertaining the proper condition of the battery. It also comes with detachable chest leads. This gives the device protection against damage in case it is accidentally dropped on the floor. 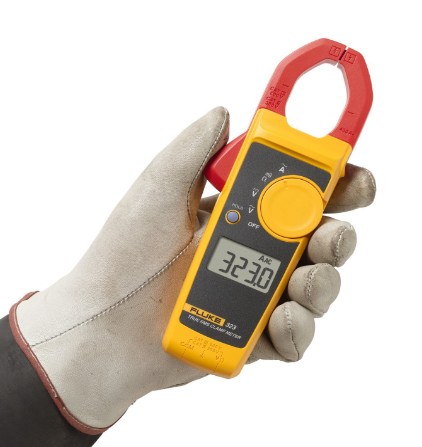 The multimeter also comes with arm straps which enables you to easily slide your arm into the meter and keep it secured while you make measurements. This feature will be very beneficial if you are making measurements on automotive electrical systems. There are different types of multimeters on the market today ranging from manual reading meters to autoranging ones. 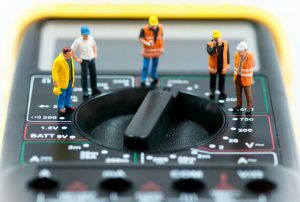 However, the most important things to look for when buying a multimeter are the measuring capacity, versatility, speed and accuracy. The INNOVA 3320 multimeter scores very highly in this regard. If you are looking for an affordable multimeter that is fast and accurate at all times, the INNOVA 3320 multimeter is the ideal choice for you.